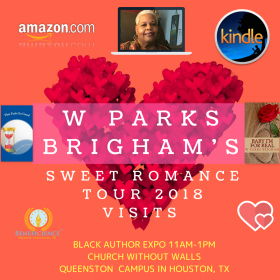 HOUSTON - Feb. 11, 2018 - PRLog -- Serial Author W Parks Brigham's Sweet Romance Virtual Book Tour Visits Black Author Expo Today, Feb. 11th, 2018 from 11:00am to 1:00pm (CT) at the Church Without Walls Queenston Campus at 5725 Queenston Blvd, Houston, TX 77084. About the Author: W Parks Brigham is a native Houstonian with two adult daughters. She has spent her adult life teaching children in the public school system and loved every minute of it. She is a retired ("Halleluiah") teacher of thirty plus years and loving every minute of it. Brigham's main interest and hobbies include listening to Pandora, her own playlist which inspires her writing, playing spider solitaire, working bent and wiggly word search, and Sudoku puzzles. She is also an avid reader of every genre in the AA Romance category, which prompted her to become a writer. Brigham says, "...It's my honor and pleasure to invite you into my world of l women fiction with romance dealing with real-life situations. I have penned fourteen of the sweetest tales. Plus size women of all ages are featured as the heroine, touching your every emotion. The heroines are beautiful and sophisticated with high self-esteem. They are not looking for a man to validate their worth…just love them for who they are. Drama, the element of surprise with twist and turns, of course, romance with a little bit of heat, are featured in each story. MEDIA BOOKING: W Parks Brigham is available for choice events, speaking engagements, radio, podcast, television and media opportunities, news interviews, et al. Brigham's media contact information + official publicist of record (Beneficience.com PR) is published below at "The Desk" eMail Desk@Beneficience.com. Tracey Bond announces Valentine's Day Book Release "Relationship InVestments and OutVestments Of For-Profit Co-OPT-erations"